Justin’s note: All month, we’ve been sharing the top insights and money-making opportunities from Strategic Investor editor E.B. Tucker. We want you to be fully prepared for when he makes his big announcement on February 27. E.B. says the key to true wealth is living a full life, rich with experiences… which is how he gets his edge. E.B. is constantly talking to people, traveling, attending shareholder meetings, and doing boots-on-the-ground research. Late last year, E.B. 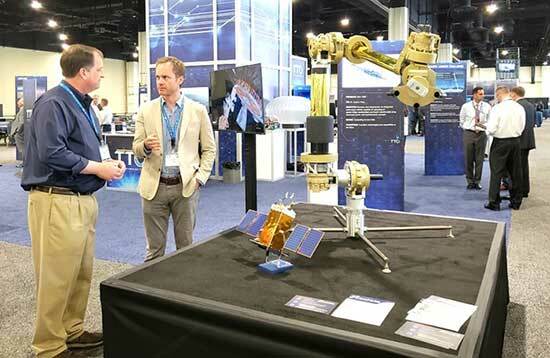 attended DARPA’s 60th anniversary conference to learn more about a huge development he’s been telling his readers about: the new space race. DARPA, as you may know, is a U.S. government agency responsible for developing emerging technologies for the military. At the conference, E.B. was able to hear firsthand how the U.S. is preparing for the new space race. The most powerful weapon in the world is surprise. Even the biggest adversary stands the chance of defeat if properly caught off guard. On October 4, 1957, the Soviet Union surprised every American… from the common man, all the way up to, and especially, President Eisenhower. The Soviets launched a tiny, two-foot-wide silver ball called Sputnik 1 into low-Earth orbit. The 184-pound satellite had four small antennas dangling from its sides. It was the first man-made object shot into orbit from Earth. What made things worse was the Soviets successfully gave the impression they now controlled the sky. Sputnik 1’s antennas broadcast a simple radio pulse back to Earth from its orbit. Amateur radio operators in the U.S. picked up the signal and listened fearfully for three weeks until Sputnik 1’s batteries died. A few weeks later, the metal Soviet ball fell out of orbit and burned up in the atmosphere. The whole drama put the U.S. government and its defense sector into panic mode. U.S. 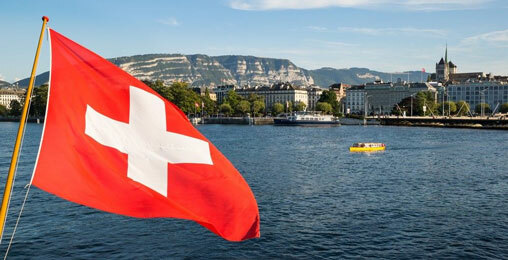 Seniors Can Now Collect Monthly Income By “Piggybacking” Switzerland’s Social Security Program?! Sputnik 1 kicked off the space race. About 100 days after the Soviet surprise, President Eisenhower created ARPA (Advanced Research Projects Agency). Eisenhower didn’t want to answer the Soviets by merely sending a U.S.-made metal ball with antennas into orbit. He realized the U.S. needed a system in place to develop technology faster than the Soviets. In an arms race, a good offense beats the best defense. 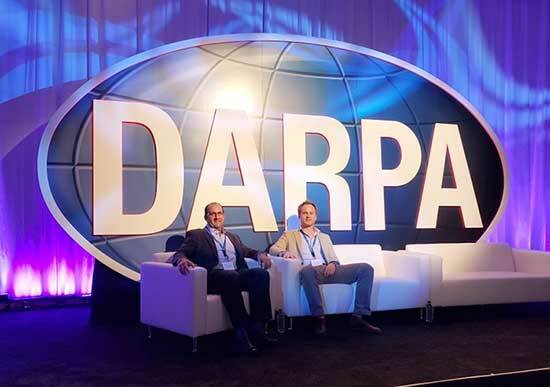 In the 1970s, ARPA became DARPA with the “D” added for “Defense.” The agency is a government research initiative designed to channel private sector talent toward defense initiatives. In addition to shepherding the U.S. space program through development, DARPA played a key role in integrated circuits, the first silicone microchips, the development of GPS, stealth technology for fighter jets, and most notably, the internet. DARPA created ARPANET, which sent the first communication messages between computers. While the most sensitive details of the technology behind today’s efforts at the agency are closely guarded, the agency itself is more open than we realized. Strategic Investor lead analyst John Pangere and I (E.B.) discovered it would have its 60th anniversary conference back in September. We paid $500 each to attend. We heard SpaceX President Gwynne Shotwell discuss the company’s plans to offer same-day, round-trip travel to any destination in the world. We learned about its Falcon 9 rocket (which will take off again… tomorrow). The plan is to get 10 launches out of each reusable, $90 million rocket. Former NASA executive Robbie Schingler made us feel better about owning terrestrial gold mining stocks here on Earth. He said, “Space mining is a pretty far bridge,” when asked about recovering precious minerals from asteroids. We spent three days listening to presentations, asking questions, and meeting the scientists who push the big ideas that turn into tomorrow’s everyday technologies. The best way to learn about an industry as an investor is to go meet the experts behind it. My biggest successes in the market have all had heavy influence from things I learned asking experts questions and carefully listening to their answers. It’s far more valuable than just looking over financial statements. When I can do both is when I find the best edge. In this case, we heard one gentleman answer questions on a panel that told us more about how to make money on the new space race than we could have learned reading every book on the subject. In 2018, we devoted our entire August and September issues of Strategic Investor to this topic. A lot of people laughed when Trump touted his new Space Force. Laugh all you want… He’s going to throw trillions of dollars at it. Michael Griffin is the Under Secretary of Defense for Research and Engineering. He’s about as highly ranked as a career defense employee can be. He made it clear he works for the country and doesn’t seem to care about the political climate of the day. Griffin told the small crowd that space will become a war-fighting domain. He said it already is and blamed our rivals for weaponizing it first. Obviously, he’s pointing to the Russians and the Chinese. When it comes to gauging what U.S. spending on a space force might look like, we think a low-ball estimate is in the trillions. The U.S. government derives its power from taxing its $19 trillion economy. If that economy goes offline, its tax revenue goes with it. That means the government plans to create, from scratch, a fighting force equal to the aircraft carriers, destroyers, bombers, fighters, tanks, and submarines it uses to fight on Earth. If the U.S. military had to create a maritime fighting force from scratch today, my guess is trillions in spending would barely get the process started. Navigating on water is much easier than zero gravity at speeds upwards of 17,000 miles per hour. Griffin encouraged us to think of the current state of space exploration as about where the Vikings were when they developed longships. That was around the 11th century, when the 20 men rowing oars with one wool sail about the size of a bedsheet got a ship moving at around five knots. That was enough to achieve dominance on the seas. That’s where we are in the space race today. Next Wednesday, February 27th, at 8 pm ET, E.B. Tucker and Doug Casey will reveal an explosive type of security you’ve probably never heard of. It’s not a stock, option, or crypto… it’s a completely different way to potentially make 1,000%-plus gains in 2019. The investment implications of a new space race are tremendous. Imagine buying Lockheed or Raytheon stock in 1955. Companies involved saw decades of spending as the U.S. threw every resource at the effort. Money was the least of its worries. We’ve recommended a few stocks related to this new space race in Strategic Investor. One of our recommendations shot up 28% in four weeks. The company makes an attractive acquisition target for a larger defense contractor. It’s rare to see an obvious multitrillion-dollar investment trend unfolding right in the open with so little coverage. It could be the nation’s obsession with Trump bashing. Several people we’ve shared these thoughts with think his space force statements are a joke. Believe me, they’re not. Going to an event like DARPA’s 60th anniversary conference gave us the chance to hear unelected career defense executives casually discuss what’s really going on. It gave us more insight into how to invest so we can pick the companies the government needs to make all of this happen. P.S. Next Wednesday, February 27 at 8 p.m. ET, I’m teaming up with Doug Casey to put on The Stock Market Escape Summit. 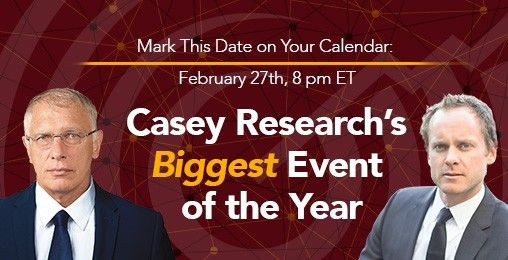 In what will be one of the most important events in Casey Research’s history, we’ll reveal a whole new approach to making explosive gains in 2019. This strategy can hand investors 10x bigger gains than options… yet it still flies under the radar today. But on February 27 at 8 p.m. ET, you’ll discover exactly what this strategy is (and why you absolutely need it in your arsenal in today’s market). This is probably a dumb question, but how does Casey recommend we invest, particularly in existent casinos, in the new wave of legal sports betting? Do we place bets on sports in these locales? Or is there some other way we can invest in those casinos? Justin’s note: Thanks for writing in, Doug. Casey Research’s expert on this is E.B. Tucker, who’s been following this emerging megatrend closely since May 2018, when the Supreme Court cleared the way for states to legalize sports betting. You can check out his guidance on it in this recent issue of the Dispatch. For his specific picks primed to rip higher, you can check out a subscription to Strategic Investor here. As always, if you have any questions or comments for the Dispatch, send them to us at [email protected].